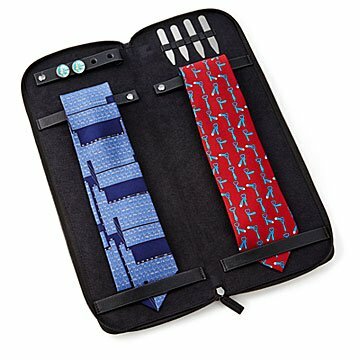 This thoughtfully designed case holds ties, cufflinks, and collar stays. If you want to look rumpled on the road, just stuff your ties into the bottom of your suitcase. For suiting up more neatly, try this thoughtfully designed case that holds four ties, two pairs of cufflinks, and two pairs of collar stays (included) in wrinkle-free style. The vegan leather case zips closed and stows neatly in your bag or briefcase. It makes a great gift for groomsmen, dads, and anniversaries. Made in China. Clean with a soft cloth as needed. 4 Stainless steel collar stays (2 pairs) included. Great treat for travelers - a unique find! Length and width prevent crowding and allows accessories to be stored with ties. It's convenient, lightweight and very easy to pack in your carryon or suitcase. It keeps all your ties neatly folded and looks great!